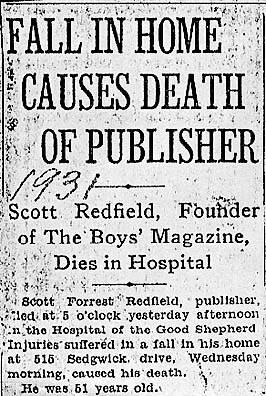 When he was 51 years old Scott Forrest Redfield, the founder and publisher of the former Boys' Magazine, died in his home located Syracuse, New York. He died after falling on the last stair on his way downstairs to get a drink of water. His doctor, Dr. Daniel F. Ruby, said that his right hip was fractured and he was bleeding internally from hemorrhages. He was taken to a hospital named the Good Shepherd where he died around 85 hours after the fall. 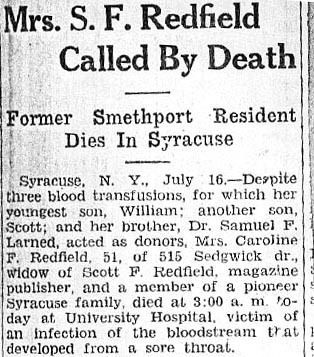 Mrs. Caroline Marie Redfield, the widow of the late Scott Redfield, died on July 16 when she was 51 years of age. As of now we are unsure of the year that she died. 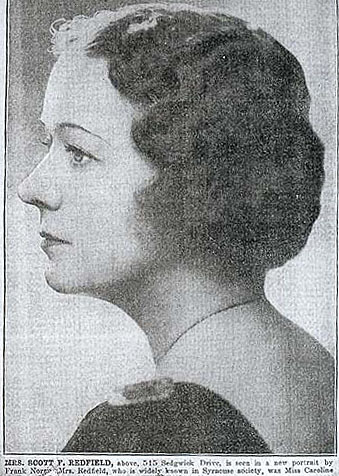 Her death was the result of an infection of the bloodstream that developed from a sore throat that she got when she was vacationing on Nantucket Island. She was flown back to Syracuse in a charter plane after the illness got more serious. To get rid of the illness meant that she would have to get a blood transfusion from one of her three sons or someone with the same blood type. 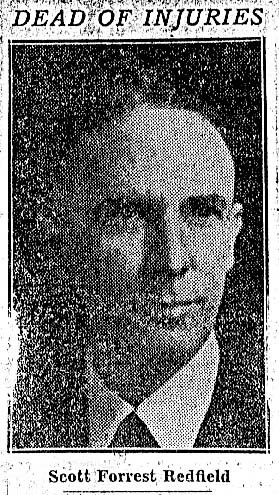 The blood transfusion appeared to have worked for awhile, but additional transfusions were done as a safeguard. She failed to recover though and she ended up on her deathbed last night at around 3 a.m. in the morning.